Revolutionary War veterans' graves listed in Biographical History of Madison County, Indiana by Helen Baumer, 1978. "Willis Swindell was born in Hyde County, North Carolina in 1763. He served with the militia of that state during the latter years of the Revolutionary War along with others of his family. This military service is verified in the supplement to the DAR Index of Patriots. "The Swindells followed the westward movement to Wayne County. He later came to Van Buren Township [Madison County]. Willis lived to be 88 years old and passed away in 1851, survived by a son, Ashley. He is buried in the western section of the Vinson Cemetery southwest of Summitville. The early Fort Wayne Trace once passed just west of it. His gravestone is in excellent condition." One of the oldest, most honored stones facing west in the old section is that of Willis Swindell. Willis served in North Carolina's militia in the latter years of the Revolutionary War. His service is recorded in the Supplement to the DAR Index of Patriots. He was born in Hyde County, North Carolina, in 1763, and after the Revolution, he and his family first moved to Wayne County, Indiana, and later to Van Buren Township in Madison County. Willis lived to be eighty-eight years old. He died in 1851 and was survived by his son Ashley. Willis Swindell's stone is in excellent condition and can be read easily. His gravestone was photographed and used by the Anderson Herald-Bulletin for a June 2002 article on Revolutionary War soldiers buried in Madison County . 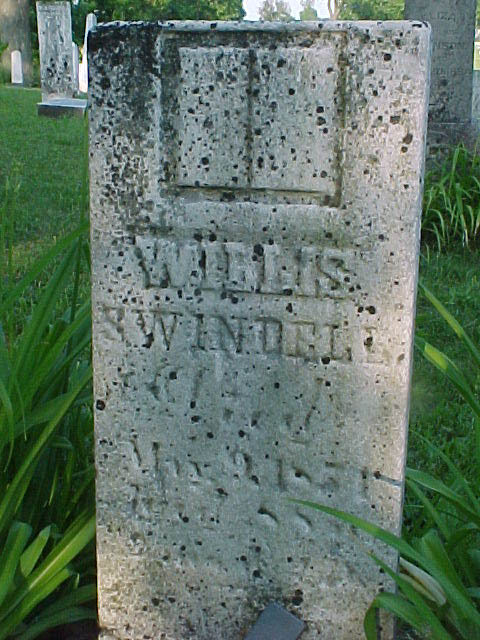 Of the thirteen RW veteran's graves in Madison County, Willis Swindell's is the only one with a legible, completely intact stone on his burial plot.